BMW is working on a follow up to the E46 CSL, applying the same approach to an E90 chassis. 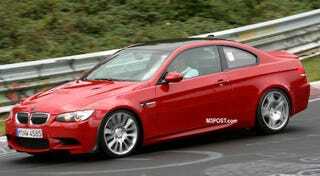 Like its predecessor, the 2010 BMW M3 CSL will drop standard equipment for weight savings and boost power. More details after the jump. BMW M3 CSL on the &apos;Ring? In addition to the absence of A/C and a stereo, the M3 CSL will also make extensive use of carbon fiber body panels and use cardboard for the luggage compartment, all in an effort to reduce weight. Of course, since reduced weight alone won't justify the $143,000 price tag, power will be boosted 50 HP to 470 HP and production will be limited to only 100 cars. There's no word on whether or not the CSL will use an asymmetrical air intake, but we'll have our fingers crossed when it appears at the Frankfurt Auto Show.